Jean-Marie Faggiano was just a little girl living with her family in the Philippines when Pearl Harbor was attacked on December 7, 1941. After the bombing of Pearl Harbor and the beginning of WWII, the Imperial Japanese Army began their occupation of the Philippines, and non-national civilians — mostly American and British businessmen and their families — were forced into internment camps. 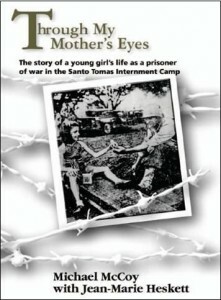 Jean-Marie and her family, along with over 3,600 other civilians, were forced to surrender to the Imperial Japanese Army and live as civilian prisoners of war at the Santo Tomas Internment Camp in Manila from January of 1942 until February of 1945. Through My Mother’s Eyes is the true story of a young girl and her family, held captive against their wishes and thrown into a world of starvation, sickness, and death. The story begins almost twenty years after the liberation of the camp, with Jean-Marie revealing to her two eldest sons, for the first time, what happened to her and her family during the thirty-seven months they were held as prisoners. Michael, her eldest son, now tells that story to you. 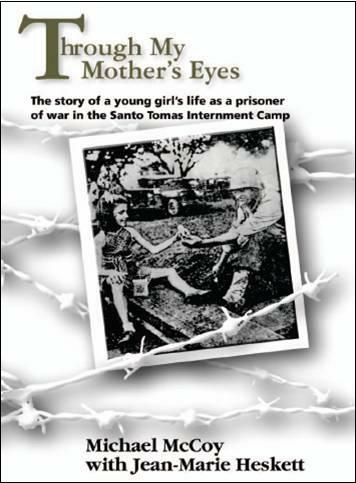 Through My Mother’s Eyes is a book you will never forget, as you experience what life was like in the Santo Tomas Internment Camp through the eyes of a young girl who strived to make sense of it all. The story will give you a shocking and compelling view into the life of a family faced with a tremendous crisis, counteracted by heroism, courage, love, and resilience.